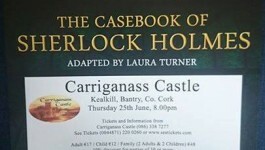 Carriganass Castle is built on an outcrop of rock on the north bank of the Ouvane River which flows west into Bantry Bay at Ballylickey, three miles away. The tower-house – the best preserved element of the castle today – was once a five-storey rectangular building that rose about 17 metres above the ground. It was built from sandstone which had been sourced from Póc an Tarbh – the Bull’s Pocket – in the hills above the castle. The stone used in the tower was covered with a lime-based mortar. The walls were built to be 2.5 metres thick. The ground floor is 9 metres long, and ?? metres wide. The first and third floors had vaulted ceilings, and this architectural feature suggests that these areas would have served as the private quarters of the castle’s residents. The second floor would most likely have been a public space where guests would have been greeted and entertained. The castle’s important business would also have been conducted here. A low attic level with a gable roof would have formed the castle’s fourth floor. The roof would have been formed with a low wall surrounding it, and a walkway which would have given access to the defensive bartizans at each corner. ‘Bartizan’ is the name for a small structure – often a turret – that projects out from a building and allows the residents to keep lookout, or defend their castle. The bawn wall which surrounds the tower is roughly rectangular in shape. It protects an area which is 42 metres in length (east to west), and 21 metres wide (north to south). The western section is the best preserved, with a wall thickness of 80cm, and a height of four metres. At each corner there is a projecting spear-shaped bastion or flanking tower which is two storeys high. There are gun-loops with splayed openings in the western and northern walls, and these features can also be seen in the bastions. The gun-loops are now only one metre above ground-height. This is due to a build-up of debris inside the walls. In the eastern bawn wall, there is blocked-up section. This may have been the original entrance to the bawn. On the southern wall, which overlooks the river, it’s likely that there were buildings which were used for administration or domestic purposes. 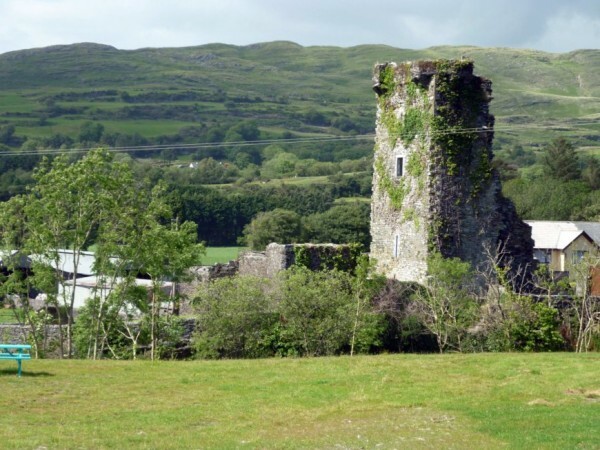 Local legend has it that Donal Cam O’Sullivan threw St. Leger, an English military commander, to his death in the river below after St. Leger’s murder of Cam’s wife Aoife at Gougane Barra. The events are celebrated in a 19th-century poem by J. J. Callanan which is entitled ‘The Revenge of Donal Cam’. The community building alongside the gate marks the spot where there was once a chimney. There are traces of a chimney stack above this building. The upper floor of the south-western bastion reveals that there was once a dovecote here. the nesting boxes were useful because the birds would have provided sources of meat, eggs and manure for the castle’s inhabitants.